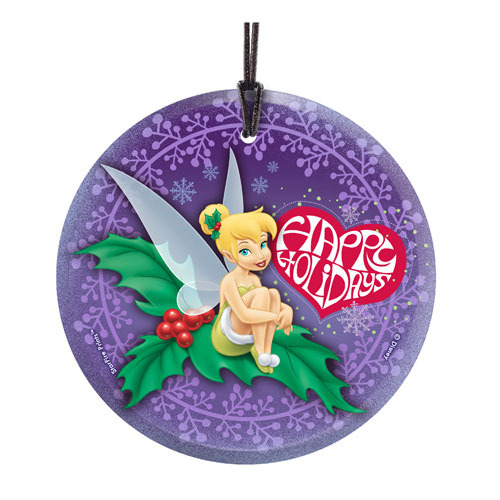 Shopping for Disney Fairies Holiday Ornaments? Happy holidays from Neverland, courtesy of Tinker Bell and this enchanting 3 1/2-inch circular Tinker Bell Happy Holidays Hanging StarFire Glass Print. Translucent yet vibrant with color, it's designed to capture the natural light, making every image a true piece of art. The glass is scratch and fade resistant, ready for display. Show it in a window or on a tree to bring the holiday spirit to your home! Display ribbon included. Made in the USA.